Readers at the second grade reading level don’t need to get on a bus or a train to see the great state of Texas. 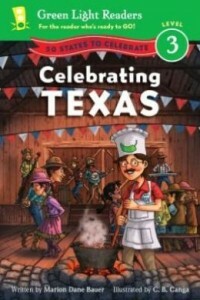 They can read this latest in the 50 States to Celebrate Series, Celebrating Texas. It will be a great addition to students’ reading lists, although it certainly can be a read aloud book for children with lower reading comprehension. Celebrating Texas is a guided tour through the state led by a pleasant character named Mr. Geo. He starts with a couple of nice maps. One is a map of Texas showing some cities and important sites. The second map places the state for the readers according to its relationship to other states and the country of Mexico. 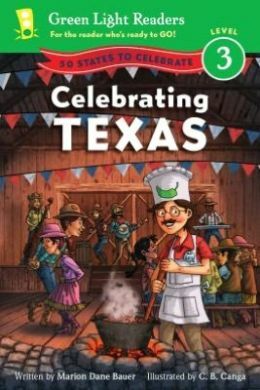 Mr. Geo guides the reader through pages about rodeos, what famous sites are in various cities, and the kinds of foods and dancing for which the state is famous. Animals are always of interest to youngsters, so Mr. Geo hikes to different areas of the state to introduce some of the animals native to Texas. The Caddo, who lived in bee-hive shaped grass houses, were a tribe of Native-Americans who first farmed the vast lands of Texas. Their word for “friends” is the origin of the name of the state. Famous Texans Stephen F. Austin and Sam Houston also are introduced to readers along with a bit of information about how they helped build Texas. Crops, sports, industries, and natural resources are also part of the state’s story, and Mr. Geo doesn’t forget those. Fun facts are found along the bottom of many pages. Four pages in the back of the book add some information and have some learning activities. A reading guide with summary, discussion questions for read aloud, teaching ideas, and a lesson can be found at http://www.scribd.com/doc/132313055/50-States-to-Celebrate-by-Marion-Dane-Bauer-Discussion-Guide. The author’s website address is http://www.mariondanebauer.com/. The illustrator’s portfolio can be viewed by going to http://www.directoryofillustration.com/ArtistPortfolioThumbs.aspx?AID=5491. Early readers will enjoy learning from this colorful book.